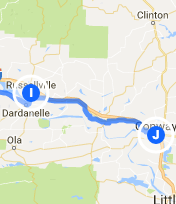 Trip Log – Day 373 – Russellville AR to Conway AR | How Will We Live Tomorrow? The straight grey line of US 64 east parallels the railroad track from Little Rock to Fort Smith. The trains roll past, long lines of flat beds and box cars and oil cars. Without fanfare, the last one whooshes past and the landscape turns still again. I long for a caboose. I have not seen a single one linked to a train my entire journey. 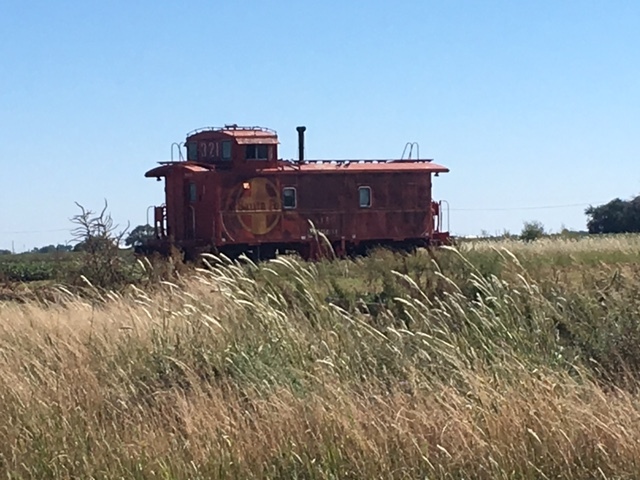 Today, cabooses are artifacts; stationary, decorative anchors in self-conscious towns whose depots are ice cream parlors; or rusting hulks left to the elements. The trains they used to terminate now flail along the tracks without any punctuation, let alone the exclamation point produced by a vintage red caboose. We are a nation of busyness and business. We’ve stripped our landscape of serendipitous delight. I’m sure it’s an inefficient hassle to hitch a useless car to the end of a snake of money. But every meal deserves dessert, and every train deserves a caboose. Not because the train needs it, not because the economy needs it, because humans need it. The caboose satisfies our craving for romance and whimsy of travel. Cabooses balance all the purpose that precedes them. We don’t need cabooses; we just like them. Our enjoyments are what elevate us above mere machines. And there’s no price tag on the joy a caboose could produce on a day grey as today. This entry was posted in Bicycle Trip Log and tagged caboose, Conway AR. Bookmark the permalink.